Salman Khan is not worried about the critical backlash against his new film Tubelight, insists his brother Sohail Khan. "Salmanbhai would be really worried if his fans and the people who pay money to watch his film were not happy," he says. "He is really concerned about the ticket-paying audience, which must not feel let down at any cost. Of course, critics have every right to feel whatever they think right." "Salmanbhai is a responsible actor. Contrary to his image, he takes his duties towards his fans very seriously," Sohail adds. "It is said he just needs to come in front of the camera and stand to make his fans happy. He can do ANYTHING he wants on screen. Or inversely, do nothing at all. Yet, Bhai chose to play a character who is humble, weak and vulnerable." "It takes a lot of guts to play this atypical hero," he adds. 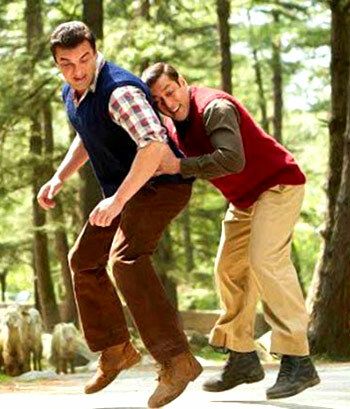 The happiest moment for the brothers, Sohail reveals, was when their father, the famed writer Salim Khan, approved of Tubelight. "Dad said what the film says about life is so important. We need to respect those who spread love in the world." "Full credit to director Kabir Khan for creating such a warm and love-filled atmosphere while shooting. Not once did Salmanbhai/em> and I have to fake emotions. Every feeling flowed effortlessly," insists Sohail. "People are confused," the actor adds. "Tubelight is not a typical Salman Khan film. He weeps, he cries, he wears his heart on the sleeve. Such emotional transparency is hard to accept in Salmanbhai because he has a larger-than-life image." "He wants to experience what it feels like to play characters who are different from what he is in real life. We should appreciate that."